Delicious and simple to make, this is a great salad for the hot summer days. 1. Prick the cucumbers with a fork and slice/chop them finely. 3. Add vinegar, sugar and salt. 4. Stir well and cook for 2 to 3 minutes or until it starts to boil. 5. Remove and allow it to cool completely. 6. Combine the cucumbers, onions and capsicums in a large bowl. 7. Pour the vinegar and sugar mixture. 8. Mix well and keep it in the fridge for 6 to 8 hours or overnight. 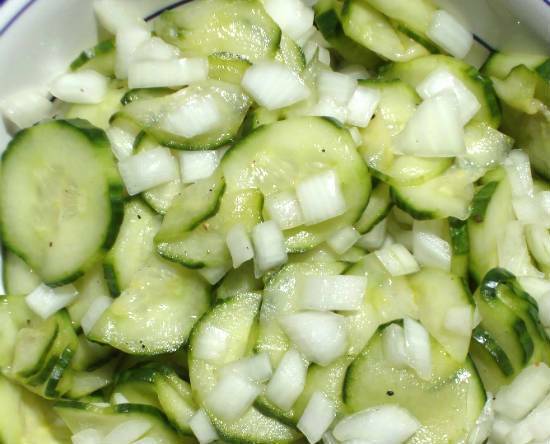 Feel free to comment or share your thoughts on this Cold Cucumber Salad Recipe from Awesome Cuisine.